Supportive of over 260 local businesses, Cedarburg Chamber of Commerce Gift Checks are the perfect gift for any occasion. Whether given as a reward for that special coach or teacher, as an employee incentive, or as a special gift for friends or family members, gift checks allow recipients to shop at a wide variety of retail businesses, or for use at local accommodations and restaurants. Gift checks may be also used at a wide variety of service-oriented businesses, as well. 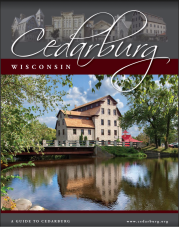 Gift checks are available for purchase in any denomination, at the Cedarburg Chamber of Commerce office. Our office is located at N58 W6194 Columbia Road, at the intersection of Portland and Columbia Roads and across from the grist mill and red pagoda. Hours of operation are weekdays, between the hours of 10 a.m. and 4 p.m.
For quick pick-up, purchasers may also call the Chamber office at 377-5856 to order in advance. Payable by check or cash only.